Powerslide’s Race Series Gloves provide a ventilated mesh glove with a removable splint (palm protector). The gloves have a terry cloth thumb that is lightly padded, velcro closure and rubber protection over each knuckle. These are NOT wrist guards, but gloves. 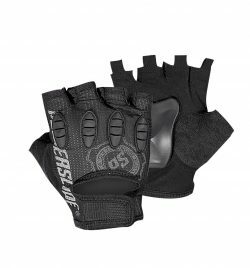 The palm protection will give good protection and/or slide, but the Race Series Glove is for those looking to minimize bulk and weight while still getting some level of protection.